The city of Gwalior in the state of Madhya Pradesh is known for its glorious history and several monuments eventually making it one of the most visited and best tourist destinations in India. Ranking among the most popular tourist attractions in Gwalior, the Gwalior Fort is a specimen of the wonderful ancient Indian architecture. The Gwalior Fort is one of the most invincible forts in India. For over 100 years this fort has been overlooking the city of Gwalior. 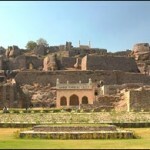 It stands on an isolated rock and is one of the biggest forts in India. Tourists from all over the world come to Gwalior to experience the moving limbs of history. Intricately designed the Gwalior fort is a great illustration of architectural skills. It is also known as the “the pearl in the necklace of the castle of Hindu”, as was described by the Mughal emperor Babur. The Fort has also been given the epithet, “Gibraltar of India”. The fort has been a mute witness to many historical battles and events. One of the most important among them, being the 1857 revolt as well as the valiant death of Rani of Jhansi, Rani Laxmi Bai, in 1558 within its ramparts while fighting against the British. Hundreds of tourists and historians come to the Gwalior Fort to get a feel of the mighty ancient Indian architecture. 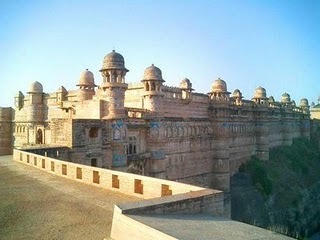 Not only Gwalior, but this fort also is the pride of entire Madhya Pradesh. Built by Raja Man Singh Tomar, Gwalior Fort has dominated the skyline of Gwalior since 15th century. Intricately designed, this was virtually an unconquerable structure, probably the safest in entire India. The beauty of its might fascinated many rulers and the fort became the subject of many poetic works. Babar, the famous Mughal ruler, once tabbed Gwalior Fort as ‘the pearl amongst the fortresses in India. The overall area covered is around 3sq. km. and the longest length is 2.4 km from north-east to south west. The walls of the fort are built of solid sandstone, which rise to a height of 35 feet. The Gwalior fort has changed hands many times, from the Tomars in the 8th century to the Scindhias who were its masters when India became independent, and each of these dynasties adorned and embellished the fort. One cannot help being impressed with the perfect blend of the Hindu and Muslim architecture that characterizes the fort and finds its fullest expression in this brilliant monument. Constructed in the 15th century the fort was an epitome of power and dignity, a dream of many rulers of yesteryears, and a fantasy of tourists today. Gwalior Fort with its magnificent architecture and many secret pathways is definitely must a visit site. Bounded by the walls of the fort there are three magnificent temples. 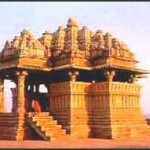 Among all the temples the most important is Teli Ka mandir. This temple was built in 9th century and is dedicated to Lord Vishnu. The towers of the temple rise to a height of 100 feet and thus this makes it the heighest building in the Fort. The roof of the temple displays Dravidian architecture, whereas the walls show strong resemblance to Indo-Aryan architecture style. The 10m high doorway has a Garuda statue on top.9th century Chaturbhuj Temple which is also dedicated to Lord Vishnu, and Saas Bahu Ka Mandir are the other two temples in the fort. Other Palaces within the Gwalior Fort, which are worth seeing, included the Vikramaditya Mahal, Karan Mandir, or Kirti Mandir Palace, the Jahagir Mahal, the Shahjahan Mahal and the Gujari Mahal. Built in 1516, the Vikramaditya Mahal with a domed roof lies between Man Mandir and Karan Mandir and narrow galleries connect these palaces. Karan or kirti mandir is a two storeyed palace with a long pillared hall built by Raja Kirti Singh. Raja Mansingh Tomar built the 15th century Gujari Mahal for his favourite queen, Mrignayani. The exterior of the Gujari Mahal is well preserved and the Palace now houses an Archeological museum. There is a large collection of Hindu and Jain sculptures, archeological pieces some dating back to the 1st, and 2nd century BC, terracotta, imitate of the Bagh (Garden), and caves frescoes. The statue of Shalbhanjika (the tree goddess) brought from Gyras Pur, an exceptional piece in miniature is kept in the museum. The ideal time for visiting the Gwalior Fort is between the months of October and March. The weather is this part of the year is pleasant with dry weather. Gwalior is also well accessible. It is well connected with other parts of the country through a well developed air, rail and road network. Gwalior Fort is the biggest attraction in the city and many buses have a route to the fort. Once you get into Gwalior, you can also hire a taxi to the fort. The fort is open daylong but the palaces inside are open to public from 9.30 AM till 5PM. The fort encloses many attractions so it will take time for you to explore every corner of it. Keep at least half a day to roam inside this splendid fort. Although you can visit the fort through out the year, but winter months are the best as the climate is extremely pleasant and the environment is less dusty. I am Susan Hannan from Exams Key; it gives 100% 156-915.71 Exam Questions. Let’s take benefit of 117-101 Exam Questions material efficiently and get guaranteed success. Check out free demo of all certifications Exam. Thanks not only for the travel suggestion but also for the interesting history lesson.